Preheat oven to 350 degrees F. Use a 10 inch cast iron skillet. You can substitute any heavy 10 inch ovenproof skillet with an ovenproof handle, or a 9 inch or 10 inch round or square cake pan, or a 10 inch spring-form pan with the outside wrapped in heavy duty foil to prevent leakage. 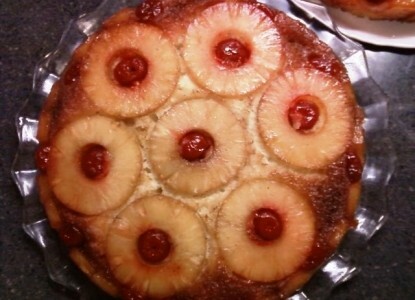 Topping: Drain the pineapple slices and cherries, reserving 2 tablespoons of pineapple juice. Place the pineapple and cherries on paper towels to absorb excess moisture. You will need 7 whole pineapple slices and 7 whole cherries. Slice the remaining pineapple slices and cherries in halves. In the skillet, melt the butter over low heat. Use a pastry brush to spread a little of the melted butter around the insides of the skillet to help prevent the fruit from sticking after it is baked. When the butter is completely melted, stir in the brown sugar and pineapple juice until thoroughly combined; remove from heat. Tip: if you are using a cake pan or spring-form pan in place of a skillet, then use a small heavy saucepan to melt the butter, stir in the brown sugar and pineapple juice until thoroughly combined, then pour the mixture into the cake pan. Place one whole pineapple slice on top of the brown sugar mixture in the center of the skillet, and six whole slices surrounding it. Place a whole cherry in the center of each pineapple slice. Place the half slices of pineapple side by side against the sides of the skillet with the cut edges down in the brown sugar mixture. Place a half cherry in the center of each half slice of pineapple. Tuck the pecans, rounded side down, into any gaps between the pineapple slices. Set aside. Batter: In a medium mixing bowl, combine flour, baking powder, and salt; sift or whisk together to mix. Set aside. In a large bowl of an electric mixer, cream the butter and sugar until light and fluffy. Tip: For each egg, crack the egg into a small bowl and whisk with a fork to thoroughly break up the egg before adding to the creamed mixture. Start with the mixer on low speed so the liquid from the egg doesn’t splatter, once the egg is partially mixed increase the speed to medium. Each egg should be fully incorporated into the mixture before adding the next egg, taking about one minute to blend in. Pour batter over the fruit in the skillet; use a rubber spatula to spread the batter evenly and smooth out the top. Bake: Bake 40 to 45 minutes or until the cake is golden brown on top and a long toothpick, wooden skewer, or cake tester inserted in the center comes out clean. Remove the skillet from the oven and place on a wire cooling rack to cool for 5 minutes. Upside Down: Run a thin kitchen knife around the edge of the skillet to loosen the sides. Invert the skillet onto a serving plate. Leave the skillet in place one or two minutes before lifting to let the syrup drip down onto the cake. Carefully lift the skillet off of the cake. If any fruit has stuck to the skillet, remove and place it back on the cake. Serving Suggestion: This cake is best when served still warm, along with a dollop of whipped cream.